Sergeant Warren Mitchell said Badu was charged after a witness offered a sworn statement to police on Thursday. 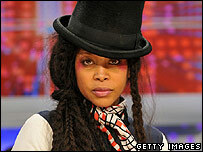 Badu's spokeswoman had no immediate comment on Friday. Sgt Mitchell added that the police department has had "people calling from all across the country to express their concern". "Having a fact witness that was there, is what let us file the charges," he said. "After much discussion, we feel that these charges best fit her conduct. She disrobed in a public place without regard to individuals and small children who were close by." He said Badu can either fight the charge or pay the fine. Disorderly conduct is punishable by a fine of up to $500 (£328). Witness Ida Espinosa, 32, declined to comment to The Associated Press on Friday.